Superior Course, Great Playing Conditions, Reasonable Cost! The Mississippi Golf Club is semi-private and member-owned. We offer a number of types of memberships to meet the diverse needs of our members. We offer superior facilities at a reasonable cost. We welcome applications for membership from all types of players, as evidenced by our various tailored offerings below. For 2019 we are offering first-year incentives to new fully privileged members, as well as ongoing discounts for active service military and for groups of 8 or more new members joining together. If you're interested, or know of neighbours, family or friends who may be interested, please contact Dan Kolar, our Pro-Manager, at 613-257-3396 or download a 2019 New Member Package from this web site. Check out our 2019 CORPORATE MEMBERSHIPS. This is the best corporate offering in the Ottawa area! 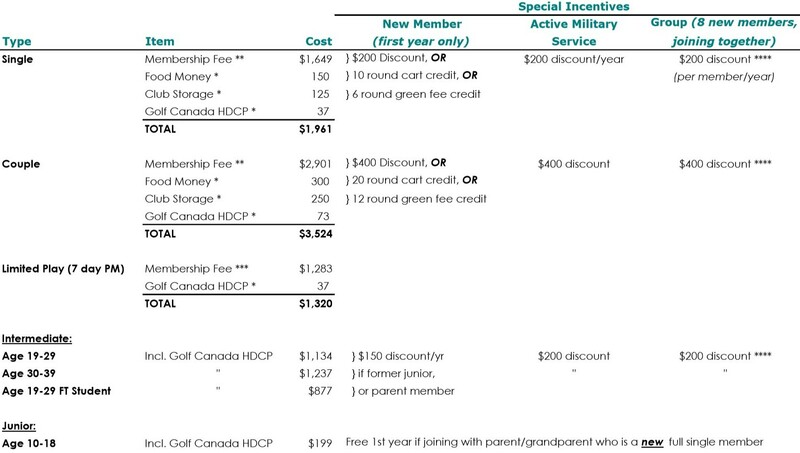 - Intermediate members qualify for a $150 discount if parent is a member, or if applicant is a past junior member. *** Limited Play membership available for play 7 days per week after 12pm. NOTE: Limited Play members may participate in the Wednesday morning men's league or the Thursday morning ladies league for an incremental season fee of $200, plus tax (or by paying daily green fees). **** Group must maintain at least 8 members to retain discount each year, or bring in equivalent new members. Copyright © 2014 Mississippi Golf Club. All Rights Reserved.